The Trojans win their first state title since 1965. AUGUSTA — After getting manhandled in football, Mt. Desert Island turned the tables on Wells in boys’ basketball with a suffocating defense that paved the way for a dominant 59-39 victory in the Class B state championship game Friday night at the Augusta Civic Center. Back in November, Wells beat MDI 44-0 in the Class C football state final. MDI forced three turnovers and jumped to a 10-0 lead, holding Wells scoreless for more than six minutes. Tyler Dewey finally ended the Wells shutout with a 3-pointer from the right corner. MDI forced 20 turnovers, and its lead was in double digits throughout the second half. For the fourth consecutive tournament game, MDI held its opponent below 40 points. Berry led Wells with 14 points and helped spark a second-quarter run that pulled the Warriors within 18-15. Andrew Phelps, MDI’s junior point guard who also played quarterback, sparked a 9-0 closing run before intermission with a three-point play, and Good converted two steals into layups to give the Trojans a 27-15 lead at halftime. MDI continued rolling in the third quarter with a pair of steals in the opening minute that led to two 3-pointers by Phelps, who finished with 16 points. The Trojans led by as many as 24 after a three-point play by Gus Reeves made it 41-17. The closest Wells could come after that was 13 after a Berry 3-pointer made it 47-34 with a little more than four minutes remaining. 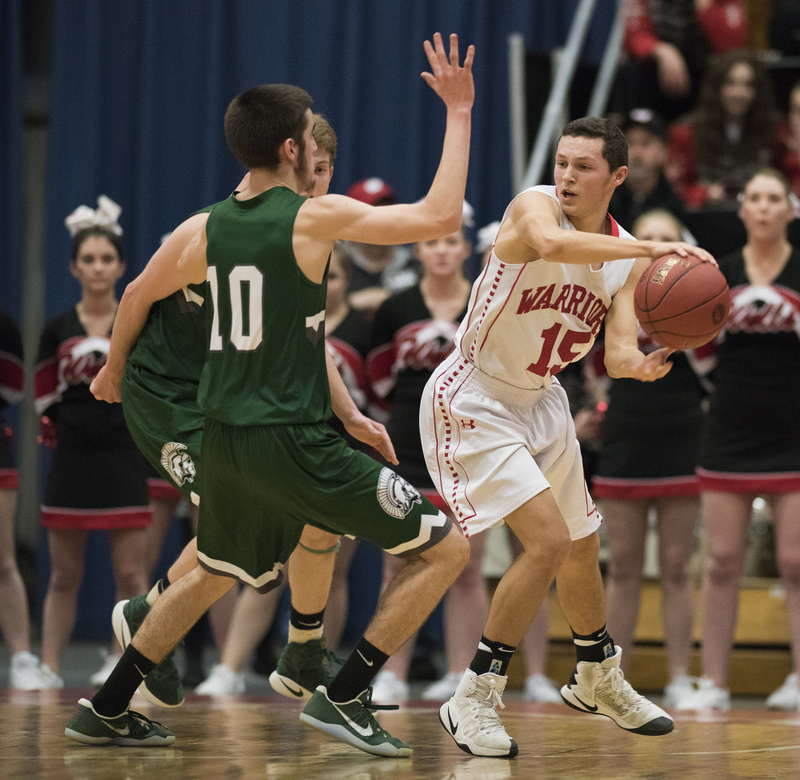 Wells had a ray of hope after MDI missed four of its first five free throws in the fourth quarter, but the Warriors failed to capitalize, in part because MDI held a 31-16 rebounding advantage. The Trojans actually had more offensive rebounds (11) than Wells grabbed off the defensive boards (10). Good finished with 15 points and 13 rebounds. Deandre Woods led Wells with seven rebounds. MDI Coach Justin Norwood substituted in waves, with 10 players seeing action in the first half. Brown stuck mostly with his starters, going three deep on the bench until the final minutes. Woods was held to two points on 1-for-10 shooting. Cameron Cousins scored eight points, half from free throws. The state title is the first in school history for MDI, which formed in 1968 after the consolidation of three high schools on the island. Mt Desert High, based in Northeast Harbor, won four state titles, the last in Class C in 1965. The only other appearance in the state finals for MDI came in 1995.